Sagen wir's so - Lana manövriert sich gut durch den Groove, der manchmal etwas kloppt - doch die stillen Momente verschaffen ihr wieder die nötige Atmung. Un remix efficace pour l'été, bien que je préfère la majesté de la version originale. Bon remix, mais je préfère la version originale. Gar nicht mal so übel, dieser Remix. Der einzigartige Zauber der Original-Version geht natürlich zum Großteil verloren - gefällt mir trotzdem, insbesondere der Prechorus. It's a great remix, but it doesn't capture the beauty of the original. Great remix. I like it more than the original. Good to see it has helped the original become a hit. remix höchstens ok, song jedoch grandios. also besser das original! Cool remix. I like this much more than the original. Really? I think more of it than I did on first listen at least but gosh what is the point. Sehr guter Remix von Lanas besten Song. C'est bien car ça relance le titre! Altijd al gek geweest op het originele nummer, maar ook deze remix is een topschijf. Van mij mag ze er een even grote hit mee scoren als het origineel en het nummer mag het zelfs nog beter doen! Wat een heerlijke schijf! ▒ Wellicht een overbodige remix van de gave track uit eind januari 2012 door de nu inmiddels 27 jarige Amerikaanse zangeres "Elizabeth Woolridge Grant", alias "Lana Del Rey" !!! Toch met gemak weer 5 sterren voor deze versie uit januari 2013 ☺!!! Ja, het origineel is beter, maar deze remix is echt wel leuk gedaan. I remember hearing this heaps last year on Fresh FM, took a while to become a chart success. I would call it a pointless remix however it got the song into the top ten so I guess that was the point. Original is far better! This just sounds like a sad attempt to make money because there's nothing outstanding or fun about it. Ok it gave the song a new lease of life but c'mon at least put some sort of new spin on things and try a little harder Cedric! I prefer the original but this is great. Cedric does this really well unlike his remixes of "Young and Beautiful" and "Adore You". Great that it gave the original a top 3 position though! It's easy to overlook this and just treat this as a punchline, but I genuinely like this remix. 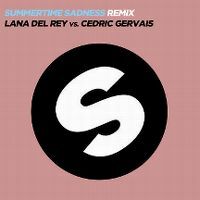 In contrast to say, Cedric Gervais's "Young And Beautiful" remix, this feels far less reliant on the source material to do all the legwork. Cedric actually re-arranges the track in a way that doesn't sound jarring (though it can be weird listening to the original nowadays!) and comes up with an original chorus to boot. It's good enough that I don't see it as condescending to radio listeners. Toch hoor ik liever het originele. Ik vind dit nummer juíst beter dan het origineel, omdat de instrumentals het nummer opzwepender maken. Het nummer zelf is mooi, maar niet een super creatief nummer. Müsste hier eigentlich "Summertime Madness" heißen. Great remix but it feels like it's missing something because all the cover versions I heard sound almost exactly the same as the original.